Morgan Stanley analyst Scott Devitt told clients on Friday that Apple could be raking in close to $1 billion dollars in 2013 from Google Search thanks to a deal that the Cupertino based firm has with its rival. While most analysts have been under the impression that Apple and Google have a deal that would pay Apple 75 cents out of every $1 Google earns with Google search on iOS devices, Devitt says that Apple would most likely have a per unit deal with Google instead, getting paid for each iOS device that rolls off the assembly line with Google as the default search engine. The analyst says that per device payments would be easier for Apple as far as accounting is concerned, and it would give Apple upfront payments. It also means that Apple would get paid even if users went to the browser and surfed to Google.com to do a search instead of using the default search box. 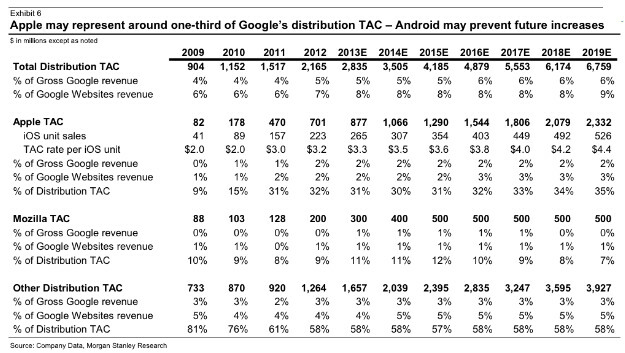 And while some Google investors worry about the payments to Apple increasing sharply, the analyst sees the traffic acquisition costs for Google on iOS devices rising around 5% a year. 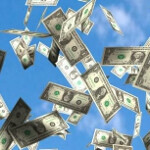 Even so, that still works out to about $1 billion that Google will pay Apple this year. While that sounds like a lot of money, which it is, keep in mind that Apple made $13.1 billion in profits last quarter. HOLY ISH that is a lot of money from such a simple thing! Innovative and creative with revenue ideas. That was a rather primitive idea. Primitive but effective - like iOS is. True. This is the lesson Apple has learned... treat your customers as primitives who need security and uniformity, your allies and partners as deserving of crippling burdens, and your enemies as deserving insane brutality. Some people apparently feel more secure when they are slapped around and told what to do. Among so many other things, Apple is also good at telling their customers exactly how things are gonna be, and in just the right ways. That, and the simple iOS platform works very well in its simplicity. Theres a lot of innovation on the iPhone 5. Google search, google maps,... Apple doing what they do best - making money off the genius of others. Well don't blame them cuz "others" are stupid enough to let them do it. You are confusing yourself as stupid while 'others' deem business as usual. From a certain set of perspectives, I suppose it is possible to consider saddling people with greivous required burdens, or the oppressive economics of the social engineering of normalcy, or even the arrogant denial of independent intellectual legitimacy, to be "innovative" and "creative." These are often mentioned in the same breath with another lovely term of endearment... "progressive." These are indeed "innovative" and "creative" strategies for those who seek to stifle the innovation and creativity of anyone and everyone else. $1 billion per year. Wow. Idk how Apple convinced Google to go with this deal, but they're sure as hell bringing in $250 million each quarter. It makes sense for Google to agree to this deal. The iPhone still maintains a huge market-share, and most of these people use search-engines. Add the fact that many iPhone users either don't care, or aren't tech-savvy enough to change their default search-engine, it's a safe bet for Google to do this rather than risk millions of people constantly using MSN or Yahoo or something else. Let's see...GOOG took in over $50 billion last year. The cost to acquire this revenue was only $20 billion. If the Apple arrangement has the same margin (a weak assumption, admittedly) then Google's doing fine, thank you. But once upon a time Google was said to earn $9/year for each Android device. iPhones (apparently) dominate mobile web usage so you expect it to do contribute in greater proportion, which would be offset by the fewer number of iOS ad-subsidized apps. Regardless, a one-time payment in exchange for a decent revenue stream seems like a good deal to me. I'm just glad i don't have bing as my search engine on my iphone. How about this analyst is full of sht and Apple put goggle as the default cause people know it's the best and want it there? Shouldn't it be the opposite? Apple paying Google for using its search engine. Google does a similar thing with Mozilla to have Google search the default engine with their web browser. Article doesn't actually say this deal is a reality, it says this is an analysts speculation of a deal that may exist. Reading is fundamental people. Hey for Google I bet it's nothing. I mean they didn't have to let apple use Google search for default browser, right? No actually they payed apple so Google search could be the default search engine.